Mount Rushmore facts for kids brings an exciting collection of facts about one of the nation’s most popular tourist attractions, hosting more than two million visitors each year. So let’s explore who carved it, when and how it was carved, its brief history, construction and many more interesting facts about Mount Rushmore! Mount Rushmore is the top tourist destination of South Dakota and the nation’s most iconic symbol, representing the first 130 years of the U.S. history. Facing southeast, the mountain with its majestic faces of the four U.S. Presidents, is exposed to maximum sunlight for good reasons. It is widely recognized as the “Shrine of Democracy”. The idea of Mount Rushmore was conceived by the state historian Diane Robinson. The gigantic 60-foot sculptures were carved out from the hard granite by Gutzon Borglum along with 400 workers. The memorial contains sculptures of the faces of four U.S. Presidents, in the order of George Washington, Thomas Jefferson, Theodore Roosevelt and Abraham Lincoln. The original design of Gutzon’s faces includes from head to waist, but it could not come about due to lack of funds. The construction was started in 1927 and it took 14 long years to complete. After the death of Gutzon in 1941, his son Lincoln Borglum carried on with the work and completed it. Mount Rushmore is actually the name of a large mass of igneous rocks in the Black Hills of South Dakota. Such kinds of rocks are called as batholiths. A batholith consists mostly of granite and quartz monzonite rock types. The mountain is mostly made up of fine-grained granite. This is primarily why the sculptor chose this peak for the carving. The rocks of Mount Rushmore are robust and do not erode easily. It is believed that after every 10,000 years, the granite erodes by only one inch. Therefore, the mountain is strong enough to sustain the carved faces for a long period of time. The native people of South Dakota are called the Lakota People or Teton Sioux. The Lakota people used to call the mountain as “The Six Grandfathers”. Its name was changed when an American lawyer Charles Rushmore went to the Black Hills in 1885. 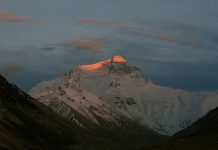 Thereafter, the mountain was named after him. Historically, the leader of Lakota people named Black Elk used to make his way through this mountain. The United States got hold of this region after American Indian Wars ended in 1878. The people who settled here came to recognize the peak by various names like Slaughterhouse Mountain, Cougar Mountain or Keystone Cliffs. In June 1930, the mountain was named as Mount Rushmore by the United States Board of Geographic Names. The memorial was initially planned to promote tourism in the region. In 1923, the idea of carving on the peak was first conceived by a state historian Doane Robinson. In 1924, Robinson pressed an American sculptor Gutzon Borglum about his idea. The original site for the carvings of Mount Rushmore was the granite towers in Black Hills, known as “The Needles”. These spires and pillars are situated within the Custer State Park. But these spires were thought to be too weak to withstand carving. Rushmore gave $5,000 in donation for the sculptures of the four U.S. Presidents. It was the largest donation by any single person. The original design of Borglum was from the face to the waist of each president. Mount Rushmore was named after an American attorney and businessman, Charles E. Rushmore of New York City. In the good old days, the Pennington County in South Dakota had a mining town known as Etta Mine or Etta Camp. In 1883, a tin mining company was established by the Harvey Peak Tin Mining Company in Etta. In order to check the mining claims in South Dakota, Rushmore traveled to the Black Hills in 1885. While on his return to the Pine Camp, Rushmore was accompanied by a local guide and businessman, William W. Challis. Rushmore asked Challis about the name of the mountain that they were passing by. Challis replied in a joking way that it didn’t have any name but from thereon, they’ll call it Rushmore. The Congress approved the carving on March 3, 1925. The carving on the mountain was started on October 4 in the same year. It took 14 years to complete the sculptures. About 400 men and women were involved in its carving. Among its workers, there were drillers, housekeepers, blacksmith and many more. The workers had to withstand extreme weather conditions during the construction. The weather at Mount Rushmore would change from blistering heat to gusty and unpleasantly cold. They would clamber up to the mountain every day through 700 stairs leading all the way to the top. At the top, there was a time clock which had to be punched-in on a day-to-day basis. There were no fatalities during the construction of this memorial. About 90 percent of the rock material was removed using dynamite. The amount of rock that was dynamited in the making of Mount Rushmore was 450,000 tons. The call boys were hired to assure safety for the workers. They used to call out loudly from the tip of the mountain and send messages to in case of need. After the rock was dynamited, it was further weakened by drilling holes close to each other, a process known as honeycombing. This way, the remaining 3-inch portion of granite was easy to get away with. The face of Jefferson was, at first, planned to be carved on the right side of Washington. But due to the unsuitability of rock, its sculpture was rebuilt on the left side. By that time, the work on the Jefferson was still underway so it had to be dynamited. The chief carver of this memorial was Luigi del Bianco. He was an Italian carver and adept at carving emotions in the sculptures. Mount Rushmore was officially dedicated by George H. W. Bush in 1991. In order to remove hard rocky materials from Mount Rushmore, the sculptors used chisels, jackhammers and dynamite. The ropes were attached to the stairway at the Rushmore’s top while the harnesses fixed with those ropes give support to the workers. A hole was carved inside the eye of each face to show an iris within the eye. Each eye also shows a kind of reflection which is introduced into the eye by fixing a granite cube. Gutzon Borglum was the sculptor of Mount Rushmore. Borglum also built the Abraham Lincoln’s bust, which is now in the United States Capitol Crypt. In the beginning of carving, the assistant sculptor to Borglum was Ivan Houser. Houser worked with Borglum for seven years. After Houser left the project, the son of Borglum, Lincoln, assumed the responsibility of his assistant sculptor. Luigi Del Bianco, an Italian sculptor, was appointed as chief carver of the sculptures in 1935. Gutzon died in March 1941 and was buried in Forest Park Memorial Park of Glendale California. The remaining work on the project was oversaw by Borglum’s son, Lincoln Borglum. Borglum’s son was an American engineer and sculptor. The height of each carved face is 60 feet. The Gutzon’s original design of the sculpture of each president includes from head to waist. But this idea came to nothing due to short of time and funds. The carving of the face of George Washington was completed on July 4, 1934. It was the first head to be carved but it was finished in seven years due to Great Depression. Next, the Jefferson’s face was completed in 1936. The carving on his face was first started to the right of Washington but then it was moved to the Washington’s left. This change of location was done due to the poor quality of rock. The Abraham Lincoln’s face was finished on September 17, 1937. Theodore Roosevelt had its face completed in 1939. In 1937, a bill was presented in the Congress for carving a head of Susan Brownell Anthony along with the Presidents’ heads. But the bill could not be passed. Susan was an American activist who fought for the rights of women. Borglum chose the four Presidents due to their role in increasing the area of land for the country and acting as the savior of the Republic. George Washington was one of the founding fathers and the first President of the United States. Abraham Lincoln is widely known for his role in rescuing the Union as well as emancipating the slaves. Thomas Jefferson was also one of the founding fathers and the author of the Declaration of Independence. However, his selection for the Mount Rushmore was based primarily on the acquisition of Louisiana territory from France in 1803. This purchase makes the size of the United States almost twice as big as before. Above all, a very big portion of the land of South Dakota was also included in the purchase. The name of Theodore Roosevelt to be carved on Mount Rushmore was put forward by the then U.S. President Calvin Coolidge. As a Republican Party leader, Coolidge said that there had to be a representation of one Democrat and at least two Republicans on the mountain. Roosevelt was leader of the Republican Party and he was selected on the basis of the introduction of the National Park Service. Gutzon Borglum had originally conceived the idea of carving an inscription (or entablature) that was to be placed alongside the giant sculptures. The inscription would explain the historic events of great significance in the U.S. history dating from 1776 to 1906. This original entablature was to be in the shape of Louisiana Purchase and its size would be 80 by 120 feet. Second, the place where entablature was planned to be built was by then had to be used for the head of Lincoln, because Jefferson’s head had to be relocated due to poor rock quality. Gutzon had also proposed to build a chamber behind the carved faces. This chamber would showcase artifacts of American history. This room would be made by cutting into the north wall of small canyon, about 80 by 100 feet. He had planned to build a granite stairway leading up to this secret chamber, about 800 feet in length. The steps would go from Gutzon’s studio and all the way up to the great hall’s entrance. There would be cabinets inside the great hall, displaying the Declaration of Independence and the U.S. Constitution. There would be busts of famous people of United States. The hall would have cast glass doors with an eagle made up of bronze, sits on top of the entrance door. The wingspan of that eagle would be 38 feet. “The Hall of Records” and “America’s Onward March” were to be engraved on the eagle. The height of the entrance would be 20 feet and its width 14 feet. The construction on this great hall of Gutzon was started in the mid of 1938. A tunnel of 70 feet was dynamited. But it was halted by the Congress in 1939. In 1941, Gutzon Borglum passed away. With his death, came the end of all construction on Mount Rushmore, which was ended on October 31, 1941. There is a secret chamber behind the presidents’ faces. It is carved 70 feet inside the rock. Inside the chamber, there is a vault along with 16 porcelain panels. The vault was inserted in 1998. The text of the U.S. Constitution, Declaration of Independence, biographies of Gutzon Borglum and the four U.S. Presidents and finally the American history, is written on the panels of this secret chamber. The chamber was intended as a gateway to the “Hall of Records”. Before displaying the finished head for the first time to the public, it was a common practice to place the flag of the United States over its face. It took seven years to complete the head of the first President, George Washington. The work on the Jefferson’s face was, at first, started to the right side of Washington. But it was blasted off by Gutzon because of the poor quality of rock on that side. For that reason, it was rebuilt on Washington’s left. Because of the beard of Abraham Lincoln, the sculpting of his face was the most difficult task for the carvers. The date of dedication of Lincoln’s face represented the 150th anniversary of the United States Constitution, the date of signing of the document in 1787. Mount Rushmore has humid continental climate. May and June are the most rainy months in this region.